But as Michael C. Corballis shows in The Truth about Language, it’s time to reconsider those assumptions. Language, he argues, is not the product of some “big bang” 60,000 years ago, but rather the result of a typically slow process of evolution with roots in elements of grammatical language found much farther back in our evolutionary history. Language, Corballis explains, evolved as a way to share thoughts—and, crucially for human development, to connect our own “mental time travel,” our imagining of events and people that are not right in front of us, to that of other people. We share that ability with other animals, but it was the development of language that made it powerful: it led to our ability to imagine other perspectives, to imagine ourselves in the minds of others, a development that, by easing social interaction, proved to be an extraordinary evolutionary advantage. Even as his thesis challenges such giants as Chomsky and Stephen Jay Gould, Corballis writes accessibly and wittily, filling his account with unforgettable anecdotes and fascinating historical examples. The result is a book that’s perfect both for deep engagement and as brilliant fodder for that lightest of all forms of language, cocktail party chatter. "Corballis writes with an academic's attention to detail in witty, self-deprecating prose. The combination of style and argument make The Truth about Language the best work yet on the gestural theory of language." "Using a wealth of well-researched anecdotes about Neanderthals, cave paintings, gesturing apes, and well-trained border collies (to name a few), Corballis exemplifies moments of the human and animal minds fine-tuning their abilities to communicate. His journey into the written world is equally broad and insightful. . . . Exhilarating and illuminating. Corballis's deluge of well-organized facts and ideas are a thrill to read. . . . The truth about language is that there's still so much to learn. A fine, accessible introduction to a captivating, and still evolving, academic field." what language is and where it comes from. I also liked the puns from a wise, successful man looking back on his career and at the ways the world around him is evolving." 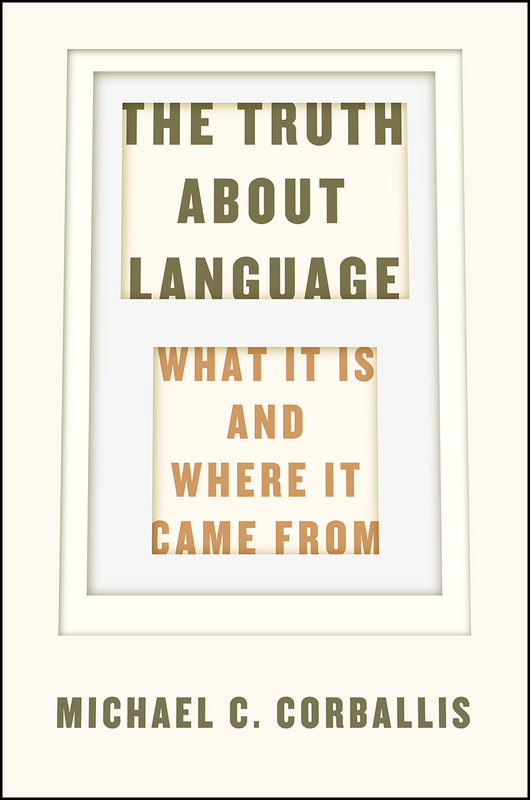 "In this wonderfully written book, distinguished scholar Michael Corballis interweaves arguments from cognitive psychology, neuroscience, paleontology, anthropology, genetics, primatology and linguistics to make a strong and timely statement: Chomsky's view of language as an innate capacity for internal thinking leaves the question of the evolutionary emergence of language in the realm of mystery. Conceptualizing language as a socially constructed tool for the communication of experience, coupled with the hypothesis--made famous in From Hand to Mouth and seriously updated here--that spoken language emerged from manual gesture, turns the mystery into a scientific question, and allows for an elegant, detailed and thought-provoking account of how our ancestors crossed the Rubicon of language." "An insightful and engaging book that challenges traditional perspectives on the nature of language and its origin. Michael Corballis offers a compelling argument for the gradual evolution of what many regard as our most distinct faculty." "The word 'truth' in the title implies that there are misperceptions to be corrected. These include those of Robert Berwick and Noam Chomsky who, in Why Only Us approach language and evolution with an undue emphasis on Merge and with no concern for mental time travel and the linkage of brain and hand whose importance is so engagingly emphasized by Corballis."